Have you always wanted to get into cooking outdoors without charcoal or propane? Pellet smokers only use hardwood pellets, a clean energy source, to get your food tasting great! 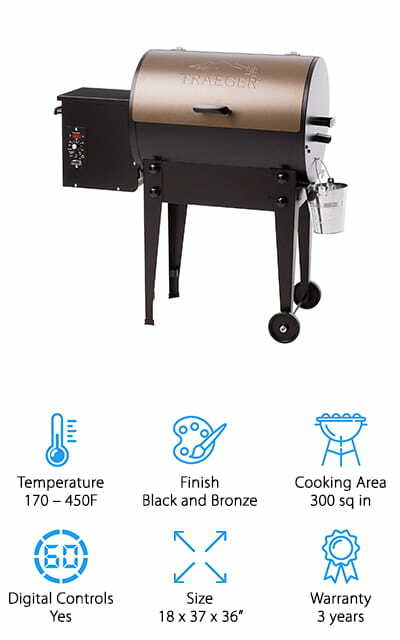 We’ve put together this pellet smoker buying guide to help you choose one that is perfect for your cookout and tailgating needs! But before we start looking at those, let’s take a look at some things you need to know! 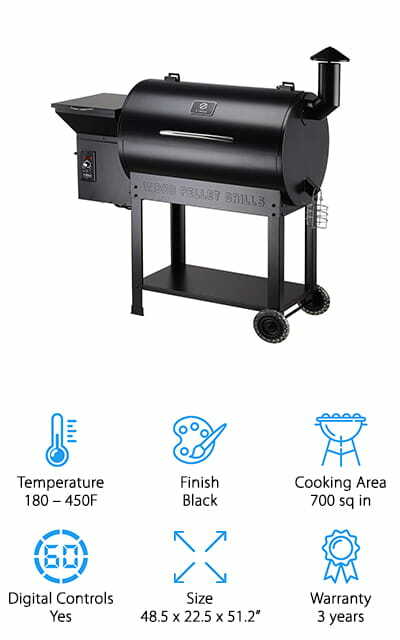 Temperature Range: Pellet smokers usually reach an ideal temperature fairly slowly, and that’s based on what your recipe calls for – this allows you a greater range of temperatures to choose from when setting your smoker up for certain meats. Finish: The metal is usually finished in black, though some of the smokers on our list feature bronze or stainless steel accents for that stylish and functional touch that is sure to wow your cookout attendees. Cooking Area: This is the total of all the surface area on the racks that are included, so smokers with more racks will have more space to cooks different meats. Cooking more at once will mean your meals are done quicker. Digital Controls: Digital controls are a super simple way to reach that target temperature. Most boast that they will maintain that temperature within 20 degrees when it’s set on the digital thermometer that’s included. Size: The dimensions of the smoker will determine how portable it is and where it will fit into your outdoor setup. A larger smoker won’t be going camping with you, but an upright one might, for example. Warranty: If there’s a manufacturing defect present in the smoker, you’re going to want to get a replacement or refund. That’s the purpose of a warranty: within the timeframe, you’re covered for their mistakes. Now that you know all there is to know about pellet smokers, let’s get to the pellet smoker reviews! We’ve done a lot of research and review, and weighed the pros and cons of each of these machines in order to bring you the very best, so you don’t have to waste your time. The top pick and budget pick are our favorites, but the rest is pretty amazing as well. 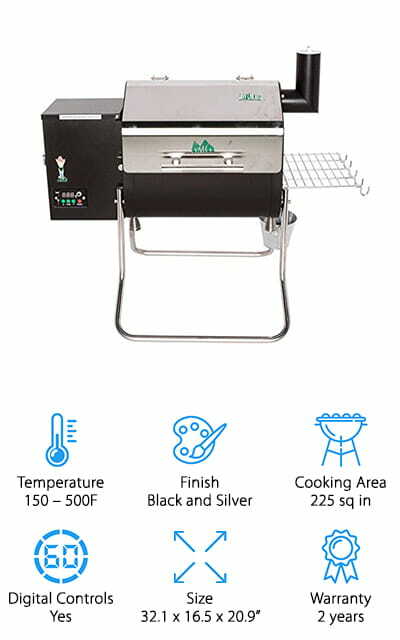 One of the best pellet smokers on the market is this Camp Chef grill, which a huge 570 square inch cooking area when combining the cooking area and second cooking rack. It has a handy grease management system, and the hopper can hold an astounding 18 pounds of pellets. There are also different accessories you can get for it, including a pizza stone. How amazing is that? Smoke food like a professional with this clean-burning stove. You can get such a lovely smoke flavor with less fuel and less time than a huge cabinet smoker. You’re going to love it! Get that delicious smoky flavor without having to babysit or watch the grill at all! You can feel confident that the digital temperature control will keep it in the right range to get delicious flavor without having to anything more on your part. It also maintains optimal pellet levels! Use the best pellet smoker pellets for great food! 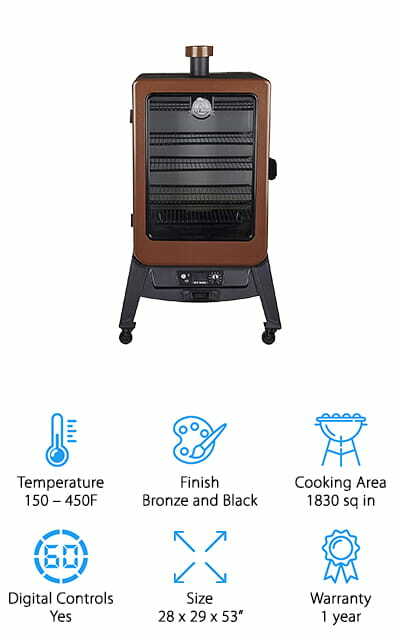 Our choice for the best cheap pellet smoker is also one of the coolest ones! That’s because it comes with a wifi enabled a feature that allows you to use an app to control the temperature remotely from your smartphone. No more having to walk out to the grill to adjust the temperature – you can do it from the kitchen as you prepare the rest of the meal. How cool is that? That feature alone definitely rates it as one of the top 10 pellet smokers we could find. The relatively small cooking area is made up for by the way the grill works and the convenience. At 65 pounds, it could be considered portable if you really want that smoky flavor while camping. It’ll perform well no matter where you stick it and put out great tasting foods, even pizzas and bread products! We love how small but innovative this smoker is and we’re sure you will too! This pellet smoker by Z Grills is one of the high-end pellet smokers on our list that is well worth the price! First off, it includes a grill cover which is an amazing value to get with the grill. There is enough storage room in the bottom cabinet to be able to store all of the barbeque tools that you’ll ever need to access. The cooking area is an amazing 700 square feet including a warming rack to get your food started on the road to the amazing smoky flavor. Of course, the types of pellets you use will also affect the flavor of your food. Choose your favorites! The hopper on this thing can hold 20 pounds of meat, and that’s pretty amazing. 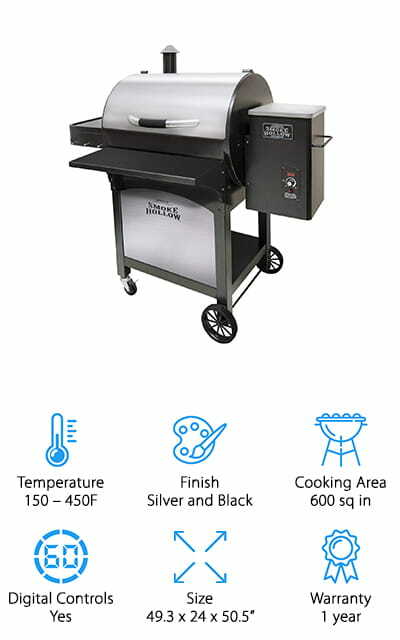 You can grill, smoke, bake, roast, braise and barbeque all on this versatile piece of equipment that will wow your dinner guests. We just love how much you can do with this smoker! One of the top-rated pellet smokers on our list is the Junior Elite from Traeger. It’s portable enough that you can make space for it with all of your other camping stuff and make delicious food on the go! It’s great for your home as well and will fit perfectly on any size deck, as well as tailgating parties. This smoker rocks them all! You can slow-cook things in the hopper, with a capacity of 8 pounds. It’s one of the best BBQ pellet smokers we’ve seen, even if it is a small one. You can take that amazing flavor anywhere and that’s the amazing thing about this particular model. You can cook things quickly or slowly depending entirely on your preference and you can tease a range of flavors out of the meat with different types of wood pellets. We love how many things you can do with this smoker, from grilling to baking, or roasting. Pit Boss makes one of the best rated pellet smokers on our list. It has a huge capacity and can smoke an amazing amount of meat at once. And not just smoke it – it can also give you a great sear, char-grill, and BBQ, as well as roast and bake! Make pizzas and kebabs, as well as grilling vegetables like asparagus over the open flame. It uses clean-burning hardwood pellets to create the different tastes and temperatures that you want in your meats and other foods. It’s even got a flame broiler for perfectly cooked burgers each and every time! Are you ready for all the delicious food that you and your family can handle? Then pick up a Pit Boss today and start getting those rave reviews at cookouts and gatherings. This flavorful smoker will make you wonder why you ever cooked inside at all because the food is just so much better this way! 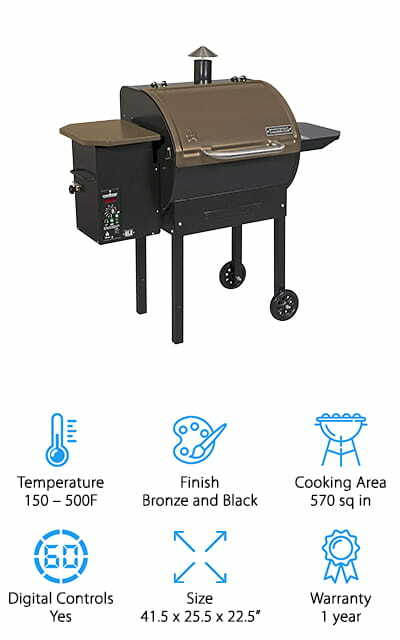 One of the top pellet smokers we found was this Z Grills pellet grill, just a different model than the one featured previously. It still comes with a free grill cover that we couldn’t be more thrilled about. There are two cooking racks, and the second doubles as a warming rack when you want to let things get ready before fully smoking or baking them. 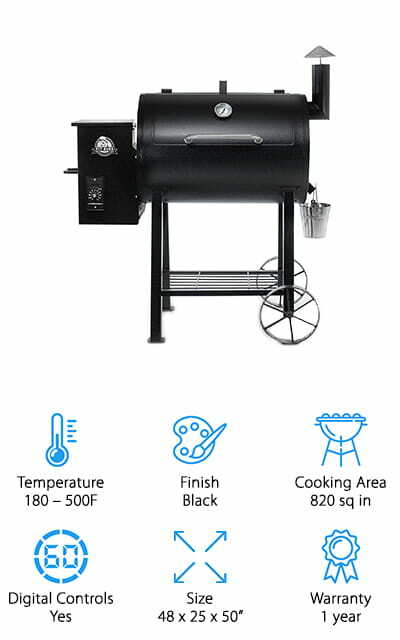 This smoker can get up to an amazing 450 degrees Fahrenheit so your foods are braised and roasted to perfection. The digital controls allow you to choose a temperature and then walk away, so you don’t have to babysit the grill to make sure that it’s doing what it’s supposed to. The hopper can hold up to 20 pounds of food – that’s 6 full racks of ribs at once for super slow cooking! This smoker is consistent and produces delicious meals every time! It’s even a candidate for best electric pellet smoker we saw. Traeger belongs in the top 5 pellet smokers with this amazing model of their smoker and grill. You can even bake and BBQ on this grill without breaking a sweat. It can cook on many different temperatures and speeds, enough that it offers six different settings and ways to cook. We love that there’s so much to do with this grill, why do you even need all of your other outdoor cooking devices? The legs fold up under the grill to allow you to take it on the go easily – at 62 pounds it’s a lot to lug around, but if you’re serious about the quality of your food during a camping trip or picnic, you won’t mind. And this Traeger grill will definitely make you want to take it with you everywhere you happen to be cooking. With a depth of 18 inches, you could even make your Thanksgiving turkey on this grill without a problem! If you’re into competition pellet smokers, you could definitely get a long way with this one. The Camp Chef SmokePro is a great little machine that isn’t so little: you get 570 square inches of cook space, enough to cook a whole lot of food at once. The pellet hopper is a large capacity area with an auger that automatically dispenses pellets as it feels that it needs to in order to increase the heat or efficiency of the smoker. We love that it takes the guesswork out for you, so you can focus on making delicious food without having to worry about the particulars that go along with it! There’s a large smoking rack and a smaller warming rack as well for getting food ready, as well as an ash cleanout system that allows you to clean the pellet tray out! This model is loaded with features that will allow you to make the most out of it! Pit Boss has made the best pellet smoker that sits up vertically that we’ve ever seen. There are five racks in this beast of a cabinet, each lending itself to the total 1830 square inches of cooking space. That’s amazing! You can cook so much meat in this cabinet, you’ll have enough leftovers for a midnight snack! The controller is completely programmable and digital, so you can control the exact temperature inside the unit. It also protects from the coldest days and nights with a double-walled construction, as well as blanket insulation to help keep the heat in and the wind and cold out. The hopper has a 40-pound capacity to help you slow smoke things for over twenty-four hours at a time. That’s going to be some juicy meat! Treat your family, friends, and guests to some amazing food with this tall cabinet smoker. It’s unlike any other that we found in our research! The 600 square feet of cooking area that come with this Smoke Hollow grill is no joke. This medium-sized smoking grill is a beautiful addition to your outdoor cooking arrangements, managing to be both functional and stylish at the same time. It’s finished with stainless steel, unique on our list, and comes with a square cart frame on wheels that is heavy-duty enough to be moved around. There is a digital LED thermostat that you can set to your perfect temperature in order to get the flavor that you want, as well as a hopper that holds hours and hours of pellets so that you don’t have to keep topping it off. This allows you to cook things according to your own recipes without relying on the grill itself to set the pace. That’s pretty amazing! 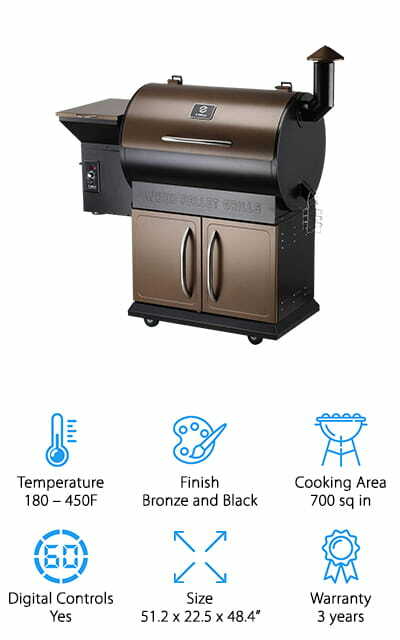 This Smoke Hollow grill is a great alternative to some of the high-end smokers with its own set of unique features!